This past week, Omega unveiled a new and interesting spin on its recently re-released tool watch that immediately piqued our interest. A coarse vertically brushed dial in a subtle shade of denim blue, mated with a slick brown leather backed denim NATO strap brings an overtly casual aesthetic to the otherwise utilitarian model. First released in 2017 as a 60th anniversary nod to the first Railmaster launched in 1957 as a competitor to the Rolex Milgauss and IWC Ingenieurs of the era. 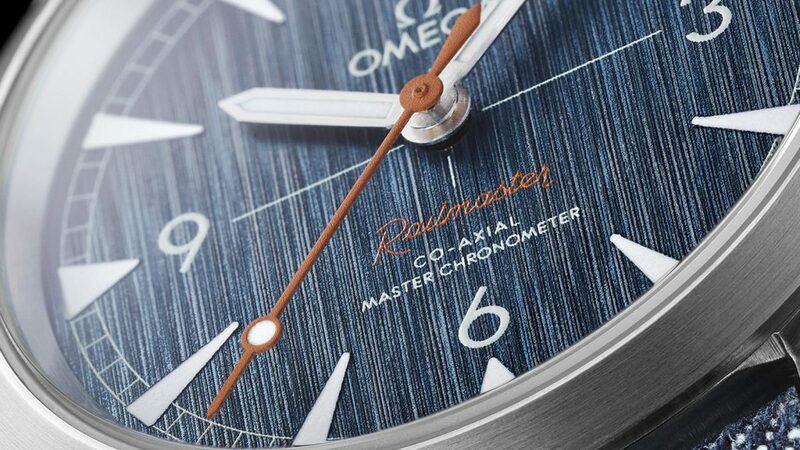 At the time, a watch capable of resisting the effects of magnetic fields was an entirely legitimate necessity for those working on rail lines (among other jobs), and Omega’s press documentation accompanying the news of the Railmaster Denim boldly plays up this connection. 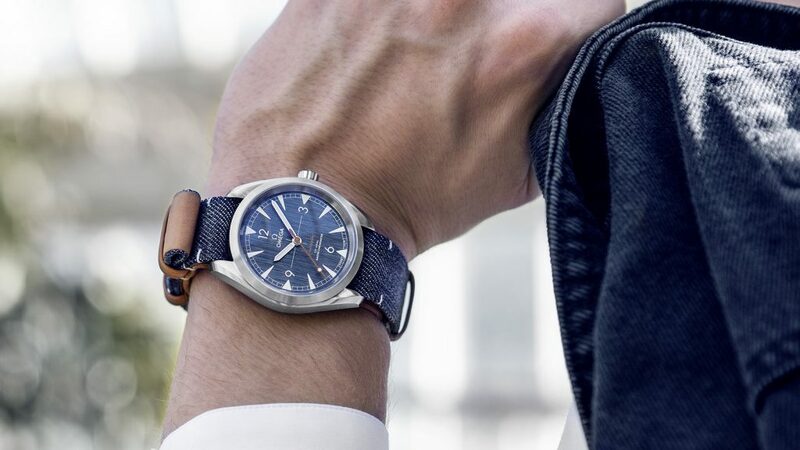 “Denim jeans were once manufactured purely for the benefit of hard-working labourers of the American West.” so the story goes, and though we suspect none of these new $4,900 watches will see the same hard life of their predecessors, we can still see the clever connection in this new Railmaster Denim’s design. As for the watch itself, this new release is anything but a simple fashion statement. Powering the new release is Omega’s self-winding Co-Axial Master Chronometer calibre 8806, which uses a silicon balance spring and delivers a power reserve of 55 hours. Its case features brushed finishing throughout, speaking further to its more utilitarian roots, and its caseback is solid rather than a solid exhibition-style back. One would think that this would play a role in the significant 15,000 gauss magnetic field resistance of the collection, however we have seen Omega use exhibition casebacks on its Aqua Terra collection that boasts the same level of magnetic field resistance. While a view of its caliber has some appeal, we have no qualms with the solid back on this release. Taking an up-close look at this new dial variant, we have to give Omega credit for how closely the texture of its vertical brushing plays up the denim-inspired look. It’s not an identical match, but it’s definitely closer than we’ve seen from other brands aside from the Hublot Big Bang Jeans—a watch that uses actual denim for the surface of its dial. If you’re not entirely sold on the all-denim look but are still a fan of this dial, there is a metal bracelet version of the watch available as well. Surprisingly, the premium to level up to the bracelet is only $100, and given the sturdy construction of Omega steel bracelets in general, this is pretty much a no brainer. The Railmaster’s fully brushed steel bracelet adds a touch more heft to its otherwise modest 40mm by 12.65mm thick case, though even in this configuration its appearance remains quite understated. 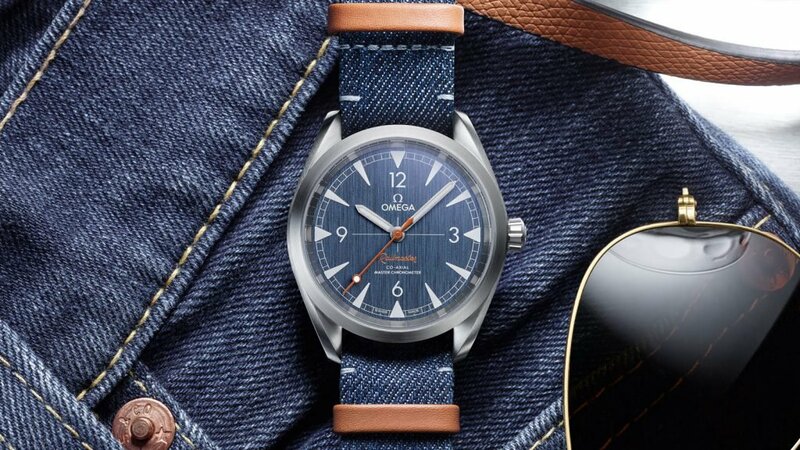 Given the choice, we would be prone to suggest purchasing the watch on bracelet, and then buying the denim strap separately afterwards, although it seems that for now Omega is only offering the denim NATO strap in black for the time being (we would hope there would be a way around this eventually). Alternatively, said black denim NATO would match the dark grey/black version of the Railmaster quite well, in case blue isn’t really your thing. In the price category, the Railmaster faces a fair bit of competition in the form of the Rolex Oyster Perpetual 39 and the IWC Mark XVIII, among others (though the Rollie’s price of entry is about $1.5k higher), but at a specifications level it is more than up to snuff. At the end of the day, the choice between it and its competitors should come down to nothing more than personal preference.